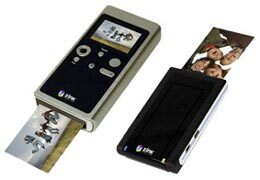 In January, 2007 Zink Imaging announced it was developing a technology that would enable mobile printing with out a drop of ink. The core of the technology was paper with incorporated color crystals that would be activated by heat of printhead. The resulting device should be similar to Polaroid cameras, combining photo camera and printer in one unit. Actually, both Zink and its innovation are successors of Polaroid. Zink started as a project inside Polaroid, now it’s an independent company employing some of ex-Polaroid specialists. After the January announcement, there has been no news from the company, except for the purchase of a factory previously run by Konica Minolta. Now Zink shed some light onto what kind of products it’s going to release. First off, a combined digital camera and printer. It turns out, Zink is not the first company (except Polaroid, of course) to try to combine the function of these two devices in one. FujiFilm and Olympus each released one model in late 1999. The Zink’s gadget is said to have 7MP resolution with 3x optical zoom, 2-inch LCD display and SD card slot. Images can be printed right away on Zink borderless 2×3-inch paper. An internal, rechargeable battery powers the device. Another product is a standalone printer. It also prints on 2×3 borderless paper and uses battery power. The printer is said to be compatible with all Pictbridge cameras and camera phones with wireless connectivity. While conducting a market research, Zink priced digital camera-printer for $199 and pack of 10 photo paper sheets for $1.69, but actual retail prices likely to change. Zink plans to release the products late in this year, that is 2007. This entry was posted on Friday, August 24th, 2007 at 12:33 am	and is filed under printer, printing, technology, Zink. "All Quiet In HP Printers"